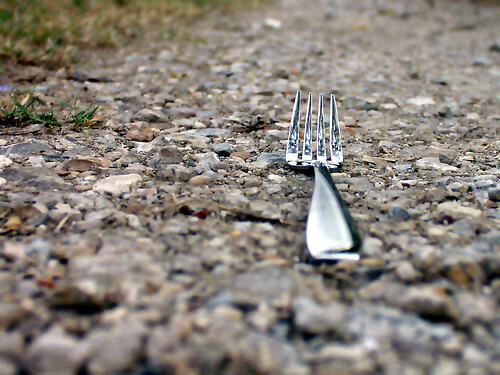 Better Projects: When you come to a fork in the road... Stop and think! When you come to a fork in the road... Stop and think! You have probably heard the original quote a million times. This variation comes to you care of Chris Matts and Olav Maassen who wrote a piece in 2007 called Real Options, which about deferring decisions until the last responsible moment. The article is applying the maths behind options trading and some phychology to decision making in software product management. Instead of saying "not yet", the Real Option approach says "Make the decision when..."
There is some good common sense in this article, but you can see people forgetting the second word of the phrase "last responsible moment." Also it's got to be hard for people to go from a pattern of planning as much as you can to planning as little as you can. I can see master practioners pulling it off, but I can also see mayhem as people abandon plans rather than schedule decisions based on the theories and ideas that support the essay. Head over, read the article - and read the comments which provide quite a few clarifications and elaborations. Photo by Whatknot and cc via Flickr. AGILE SYSTEMS engineering," Prof. Reinhard Haberfellner and Prof. Olivier de Weck. Weck and Erdogmus did much work to bring RO into the IT world. Goggle will find most of their works.